I love the way that recipes can be passed along generations, and across continents and cultures. 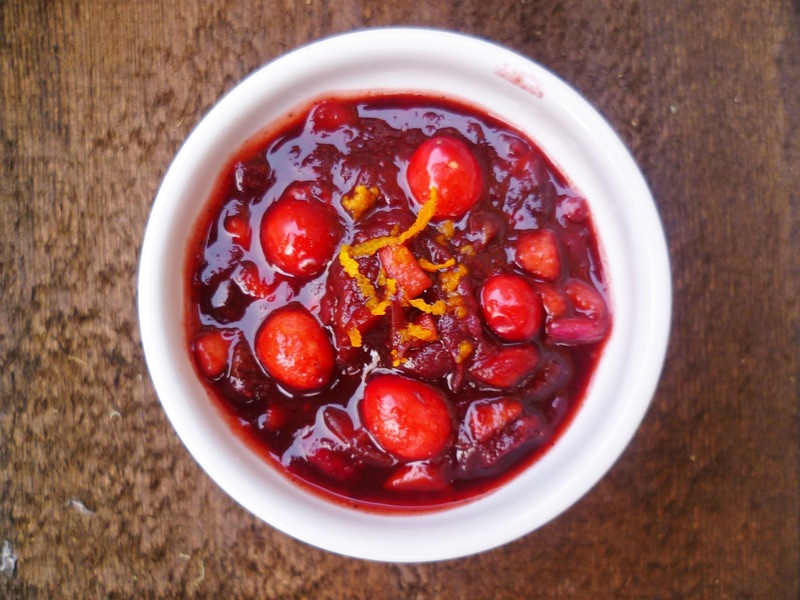 A few years ago, an American friend of mine introduced me to the joys of her family's cranberry relish recipe. Her version used raw ground cranberries and oranges and it was very nice indeed. I decided to make a cooked version with spices, for a more Christmassy feel, which has become a new tradition in my family on this side of the pond. I am not entirely sure that this counts as a relish, more of a sauce. However, it will last quite well in the fridge after opening (for at least two weeks, if not more). It is very good served with leftover cold roast meats and is a particular favourite in sandwiches. Heat the wine in a saucepan together with the spices. Bring to the boil and simmer for 10 minutes. Add 200g of cranberries and the rest of the ingredients and simmer for about 40 minutes, stirring frequently. The mixture should be thick. Add the rest of the cranberries and cook for a further 10 minutes, until the cranberries have softened but are not squishy. Transfer to a sterlised jar and seal. Store in the fridge or in a cool dry place. It will last well for several months.